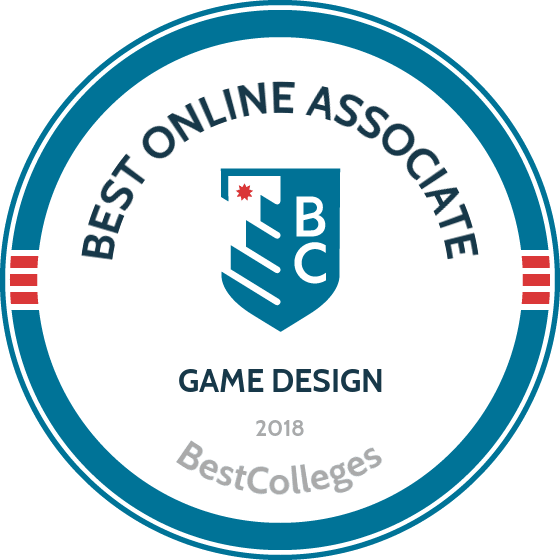 What Are The Best Online Associate in Game Design Programs? What Else Can I Expect From an Online Associate in Game Design Program? What Can I Do With an Associate in Game Design Degree? If you love playing video games, you may find that an online associate degree in game design is an ideal fit. The degree explores subjects such as software programming, web design, animation, and drawing, all of which prepare students for careers in testing, designing, and producing video and computer games. The skills you learn in an online game design school also prepare you for related jobs in web development, an area the BLS projects will grow by 15% over the next decade. Graduates often pursue bachelor's degrees, opening up even more career opportunities that blend design and computer programming. Located in Prescott, Arizona, the associate of applied science in video game development at Yavapai offers distance learners the chance to learn cutting edge programming and design. Degree candidates learn to develop digital, commercial, casual, and educational materials that are used in a wide variety of industries. With courses like video game development for game engines, multiple classes in animation, and 3D modeling, Yavapai specializes in training students to create 3D environments for use in video games on PCs, Macs, and independent gaming systems. Online learners must complete a total of 60 credits, which usually takes two years. Students in the online associate degree in game design program are eligible to apply for financial aid, including federal loans and grants. Students can apply for scholarships through Yavapai and external sources. These awards are both merit- and need-based. Located in Charlotte, North Carolina, CPCC offers an associate in applied science degree in simulation and game development. In this program, degree seekers work with the most advanced software, including Autodesk and Adobe products, Blender, Unity, Unreal Engine, MS Visual Studio, and Xsens. CPCC requires learners to earn a total of 69 credits to graduate with the online associate degree in game design. Full-time students can expect to spend two years working toward the degree. Many of the major-specific courses for this program have prerequisites or corequisites. The school encourages prospective and transfer students to read course descriptions carefully or contact the department for guidance. Located in Illinois and founded in 1901, this junior college boasts a cutting edge game design and development program. Full-time students can expect to spend two years working toward this 67-credit associate degree of applied science in game design and development. General education requirements consist of 16 credit hours while 31 credits focus on major-specific courses, such as advanced programming, 3D modeling, game production, and game development. Degree candidates have some flexibility in this program and may take electives to pursue professional interests and supplement their core courses. All students, regardless of their state of residency, pay the same tuition rate to earn their associate degree in game design online. Joliet offers special financial benefits for active military personnel and veterans in addition to scholarships and work-study programs. Most awards are need-based and require students to complete the FAFSA to be considered for financial aid. The associate of applied science in video game design artistic track at WITCC specializes in building on traditional art and design techniques to produce modern animation and virtual environments. Graduates are able to understand and execute the entire game development life cycle, including designing, developing, testing, and deploying interactive software. Students who earn the game design associate degree online often pursue careers as 3D modelers, animators, game support specialists, game analysts, and computer programmers. Online learners must complete a total of 65 credits in order to graduate. WITCC offers a round table club devoted to further honing members' design and animation skills beyond what is required in the classroom. This group offers extra practice and resources for incoming students, presents design projects at education conventions, raises money for charities, and is recognized by the International Game Developers Association. Members also gain access to the club's advanced software and equipment. Online video game design schools are all different, with some focusing more on the design and storytelling aspect of video games and others focusing more on concrete computer and programming skills. Although most programs share certain qualities, the details discussed here may differ depending on the specific school and program. Animation: Students learn the basic skills of 2D and 3D animation necessary for video or computer game design. The course also covers how to use animation hardware and animation systems. Some courses introduce advanced topics like virtual reality. Game Design: This class covers the programming language, software, operating systems, and design systems necessary for the creation of video games. Students explore areas of computer science such as game theory, artificial intelligence, and graphic design. Storyboarding: In this course, students learn how to create a storyboard to produce a compelling video game narrative. Students study case histories, examining the creation and execution of well-known video game narratives. Learners examine the art of hand-drawing storyboarding and using storyboarding software to visualize and map game narratives. How Long Does it Take to get an Online Associate in Game Design? Most video game design schools online require around 60 credit hours of coursework. Students typically earn their online associate degree in two years or fewer, depending on how many courses they take each semester and whether they transfer into the program with any prior credits. Some programs follow a cohort format. In a cohort, students advance through their online degree at the same pace as their classmates. This format restricts the flexibility of how quickly students can graduate, but allows them to meet others in their field who share similar interests. The cohort model is best for those who prefer to learn with others and network with their peers. Self-paced programs allow students to advance through their coursework at their own pace, thereby earning their degree in less or more time than they would otherwise. This model is best for those with a busy schedule who require a more flexible learning format. When a school is accredited, a recognized accrediting agency has reviewed the quality of its programs and deemed the school up to standard. While both national and regional accreditation show that a school can provide a quality education for the cost of its tuition, most people consider regional accreditation more prestigious than national accreditation. While the majority of nationally accredited schools will accept transfer credits from regionally accredited programs, not all regionally accredited schools will accept credits from nationally accredited programs. This distinction is especially important to keep in mind when choosing an associate program, as some bachelor's programs may not accept transfer credits from a nationally accredited school. You should always make sure that a school is accredited by double-checking the name of the accrediting agency against one of the official lists posted on the Department of Education's website or the Council for Higher Education Accreditation website. A few common regional accrediting agencies include the Higher Learning Commission, the Middle States Commission on Higher Education, and the Western Association of Schools and Colleges. Common national accrediting agencies are the Accrediting Commission of Career Schools and Colleges, the Accrediting Council for Continuing Education and Training, and the Accrediting Council for Independent Colleges and Schools. Two agencies oversee the monitoring of accreditation agencies: The U.S. Department of Education and the Council for Higher Education Accreditation. The Department of Education is a government agency, while the Council for Higher Education Accreditation is a non-profit organization comprising 60 accreditation agencies and 3,000 universities. Together, these agencies ensure that American universities provide a quality and affordable education. They also publish a list of accredited schools, thus protecting the public from schools that are either illegitimate or underperforming. You can find these lists on the ED or CHEA website. In addition to designing video and computer games, game designers can apply their skills in a variety of related career fields. Graduates can work as web developers, game testers, drafters, desktop publishers, and entry-level graphic designers – essentially any career that requires a combination of creative design skills and computer savvy. The degree also prepares you for more advanced degree programs involving design or computer programming. Music directors lead musical groups, orchestras, and other music performances. Music directors most often work for local groups that put on musical performances, such as schools or religious organizations, but may also travel to out-of-town performance venues. Composers write music and typically work from home or at a recording studio. Web developers design and create websites for a variety of clients. In addition to managing the appearance, aesthetic, and usability of a website, developers also monitor the website's traffic. Developers sometimes create the site's content. Drafters help a professionals convert designs into technical drawings. Engineers and architects, for instance, commonly use drafters to convert their blueprints into detailed visuals of anything from engine designs to building blueprints. Drafters rely on technology and artistic skill to create intricate designs. Multimedia artists and animators help bring television shows, video games, and movies to life through animation and other visual effects. Some artists and animators work from home on a contract basis, while others work in large offices for animation or production companies. After you earn an associate degree in game design, you may want to consider transferring into a bachelor's degree program in a similar field. Many higher-paying design and programming jobs require at least a bachelor's degree and a portfolio of design work. Software developers, for instance, usually have bachelor's degree. These professionals earn a median salary of over $100,000. Without a bachelor's degree, you may only qualify for entry-level positions. Bachelor's in video game design: The most obvious degree for those who earn their associate in game design, this bachelor's degree offers a more in-depth and involved exploration of game design. Students create a portfolio of work which they can then show to employers. Graduates are for intermediate positions in the gaming industry. Bachelor of arts in graphic design: Students who earn a bachelor's degree in graphic design learn how to create visual content in order to communicate a message or emotion, most often for the purpose of advertising to consumers. They design brochures, advertisements, reports, and magazines. Graphic designers rely on both computer programs and hand-drawings to create their work. Bachelor of science in software engineering: Students in a software engineering program learn how to design and engineer computer programs. The bachelor's degree blends the study of engineering and computer science. Graduates go on to design, evaluate, test, and maintain computer software. For associate degree holders working as multimedia artists and animators, the top-paying states are all located on the coasts. A large percentage of tech companies and AAA video game studios are located in California. Since these studios have the largest budgets and produce the highest-selling video games, they can afford to pay their designers and animators the most competitive wages. For the top five highest paying states, the annual mean wage is more than $10,000 above the field's overall medium wage of $65,300. Professional organizations can help game designers, web programmers, software engineers, and graphic designers connect with other professionals in their field. In addition to building community and facilitating networking opportunities, many professional organizations offer practical benefits such as legal advice, job boards, discounts on design and computer supplies, and professional development experiences. Other organizations host trade shows and conferences, providing an additional avenue for designers to network with others in the field of video game design. IGDA brings together game developers, programmers, writers, artists, and designers from around the world. The organization hosts conferences and advocates for those working in the gaming industry. IGDA welcomes all levels of game designers, from those working in AAA studios to those who are still learning the craft. ESA is a U.S. organization that supports companies involved with the publishing and dissemination of video games. They offer many benefits, including a content protection program and business and consumer research. They also host the world-famous global video game trade show, E3. The Graphic Artists Guild helps its members advance their careers through support and advocacy. They welcome all kinds of graphic artists, including animators, web programmers, developers, and game designers. Members can access career development opportunities, legal and practical advice from industry veterans, and discounts on books, supplies, software, and online marketing services. If you're looking for ways to pay for an online associate in game design degree, you should complete a FAFSA form. Completing a FAFSA allows you to receive federal funding opportunities such as grants, loans, work-study opportunities, and scholarships. You should also research each individual school's financial aid opportunities to see if you can apply for additional funding, scholarships, or tuition assistance. Some schools also offer tuition waivers, discounts, or other financial aid opportunities for military members and veterans.